This is just one of those yearly Christmas songs that is played and sung by people without a lot fanfare. It has a simple but profound message. 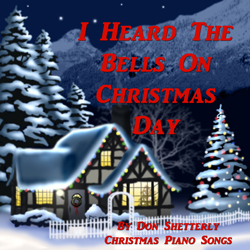 I Heard The Bells On Christmas Day is a favorite standby for songs at Christmas time. While I cannot say that I played this one a lot growing up it was and is still a song that describes the Christmas theme . Track #13 of 15 songs on Christmas Piano. The author, Henry W. Longfellow wrote much religious poetry but little of it was set to music. Around 1864, these words were set to the music of “I Heard The Bells On Christmas Day” with the music sounding like the ringing of a bell. Henry Longfellow wrote these words in the midst of the American Civil War after learning of his son being injured as a soldier. I Heard The Bells On Christmas Day carol was originally a poem containing seven stanzas. Two stanzas were omitted which had references to the American Civil War. In 1872, John Baptiste Calkin slightly rearranged the words to fit the tune that he created. Had roll’d along th’un broken song of peace on earth, good will to men. For hate is strong, and mocks the song, Of peace on earth, good will to men. The wrong shall fail, the right prevail, With peace on earth, good will to men.